In the Rags to Riches slots you get to take a look at both sides of the track. Click here to play! Rich and poor come together like two side of the same coin - but the rich side owns the coin, while the poor side works itself into the ground serving as the bottom side of the coin. If you win the top prize of 25,000 coins, then you can say goodbye to rags, and hello to riches! The symbols in this game cover two extremes wealth. On the one hand, there are cardboard boxes, old sneakers, bowls of soup, skateboards, and homeless people. On the other, islands for sale, piles of gold bullion, fine Cuban cigars, aged Cognac, and beautiful people wearing suits and elegant gowns. It's one way or the other in the Rags to Riches slots, and you know which side you want to be on! Play the Rags to Riches slots now to see if you go from pauper to prince in a whirl of the reels. 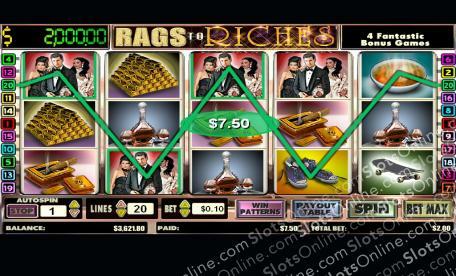 The Rags to Riches Logo symbol is the scatter in this game, and it pays back your bet when 2 land on the reels. The bonus is triggered when 3 or more scatter symbols land on the reels. In this game, a random number from 1 to 49 is displayed, and the player must guess whether the next number will be higher or lower. An equal number is a loss, and 2 incorrect choices on any level will end the game. As each level is completed, the player may choose to take the accumulated winnings or continue playing. If the player ends the game in the middle of a level, they are awarded the consolation prize instead of the accumulated winnings. If all levels are passed without an error, the Jackpot Game is triggered as long as the max lines were played on the slots bet. In the Jackpot Game, the player chooses from 16 boxes on a grid, trying to choose the box with the treasure. The player is awarded the prize in the box that was chosen.